Palmdale Sheriff’s Station deputy Ray Wilson speaks with a local business owner at the Palmdale Station’s first ‘Coffee with a Cop’ event Feb. 7. PALMDALE – “Coffee with a Cop” returns this Friday in Palmdale. Officers from Palmdale Sheriff’s Station and local residents will come together in an informal, neutral space to discuss community issues, build relationships, and drink coffee. The event begins at 9 a.m. Friday, March 7, at the McDonald’s located at 131 East Palmdale Boulevard. All community members are invited to attend, and the coffee is free! 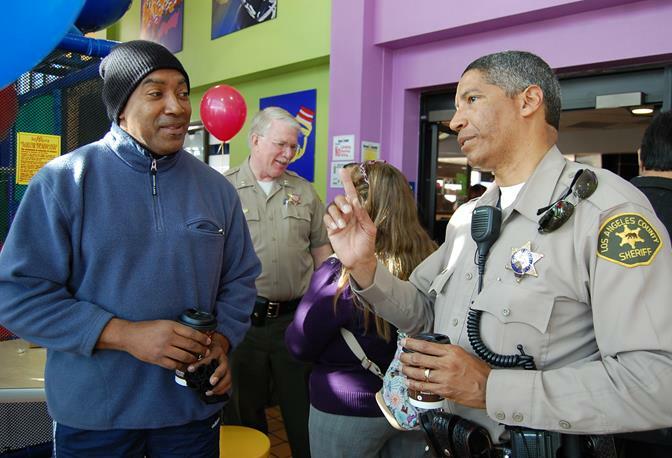 Coffee with a Cop debuted last month in Palmdale to a mostly positive crowd of about two dozen residents. The Sheriff’s Department’s volunteer programs, the protocol for investigating missing persons, and traffic hazards at local schools were just a few of the topics discussed at the first gathering. Read more here. Officials are hoping to draw an even bigger crowd of interested residents this time around. The program aims to advance the practice of community policing through improving relationships between police officers and community members, one cup of coffee at a time.